The Brown County Sheriffs office is implementing a new program regarding ammunition/weapons. I have been approached by several citizens that have had weapons and/or ammunition that they have wanted us to dispose of. I have spoken with the BATF and inquired what process needs to be followed to do so in accordance with legal guidelines. It is of their opinion that we can accept firearms and/or ammunition by the legal owner for disposal by the Sheriffs Office. Naturally the serial numbers will be checked to make sure the weapon does not show up stolen, etc. 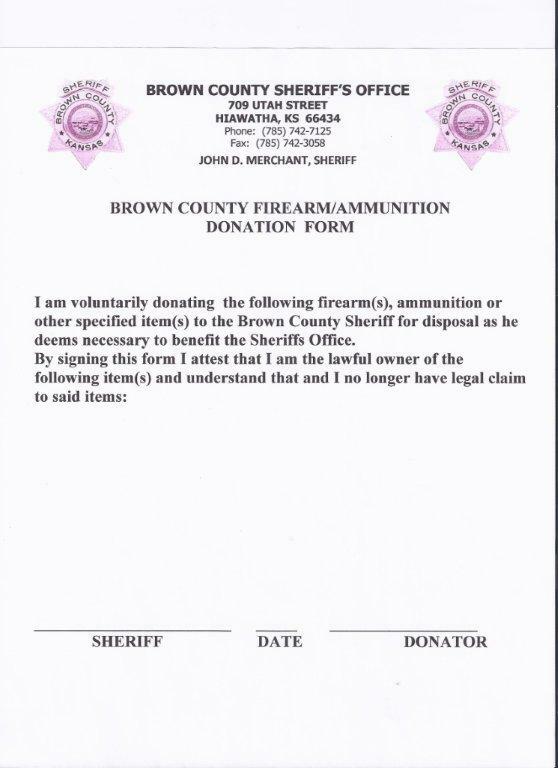 Anything of value can be traded to our firearm/law enforcement vendors for credit that would go towards Brown County Sheriffs office purchases to benefit the department or directly used by the Sheriffs office. Officers and staff will not be allowed to take personal possession of any of the items brought in to the Sheriffs office under this program. A form will be used that the legal owner must sign, giving the Sheriffs office permission to dispose of in the manner which benefits the department.